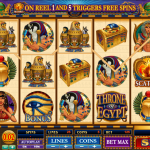 At first look, Throne of Egypt looks like a very power video slot game from Microgaming. And it turns out that it really is. Step inside the Pharaoh`s tomb and get a hold of his riches. Meet some characters from the Egyptian history and they will help you in your mission to sit upon the Throne of Egypt. Throne of Egypt is packed with special features. Let’s start with the game logo which is the wild and it not only stands in for every symbol except the scatter to complete a winning line, but it also appears stacked on the reels. The burning flame is the key to the free spins feature. Land the scatter on the first and the fifth reel and receive 15 free spins with all wins doubled. The Eye of Horus is the bonus symbol and it will activate the Bonus Chamber, the main bonus game. You need to land the symbol on the second, third and fourth reel and work your way through the chambers. 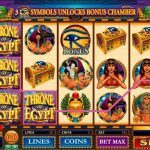 First you have the Scarab Bonus, then the Eagle Bonus and the last one is the Princess Bonus, now this is where you want to end this bonus and grab some huge winnings. 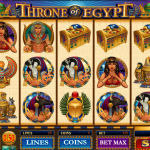 Microgaming is the name behind this superb online slot, Throne of Egypt. We enjoyed every minute while playing this game and we have to say that it has a huge potential to pay big time. You do not have to wait for the features to take you out of the gutter since the stacked wilds during the base game have the power to do that. All in all, this is an amazing slot which offers lots of fun and lots of riches. You really don’t have to be a rat lover to love The Rat Pack a 5 reel slot by MicroGaming. Try it and you’ll know why!